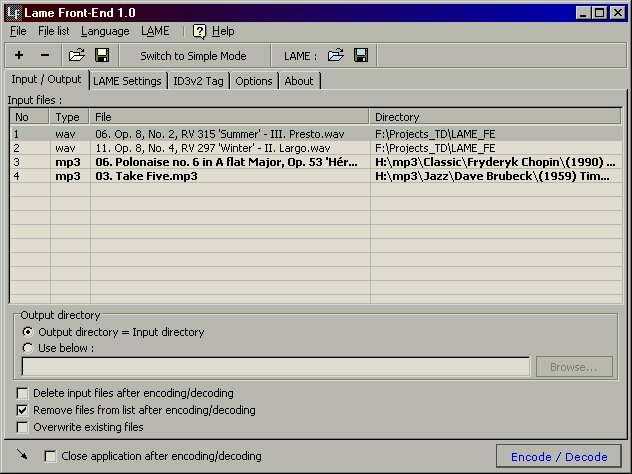 Lame Front-End is a graphical interface for MP3 encoder / decoder - lame.exe (included in program archive).This MP3 encoder / decoder is designed for LAME 3.97 (last release version in November 2006).Lame Front-End can work in batch mode, so it can be used by external applications to encoding/decoding files, e.g. by Exact Audio Copy, CDex. Lame Front-End is a graphical interface for MP3 encoder / decoder - lame.exe. Create an autorun / autoplay / autoinstall CD. Free sunset wallpaper with unusual cloud Landscape! Are you ready for the next realm of Breakout? Transfer waypoints, routes and tracks between your Garmin GPS and PC. Only 1.00. Turn your monitor into a dazzling fire flaming screensaver. Qweas is providing links to Lame Front-End 1.6 as a courtesy, and makes no representations regarding Lame Front-End or any other applications or any information related thereto. Any questions, complaints or claims regarding this application Lame Front-End 1.6 must be directed to the appropriate software vendor. You may click the publisher link of Lame Front-End on the top of this page to get more details about the vendor.